Suffering Love: Out of town? In the bag! I'm sorry about that title. You see, I have a huge family who are all incredibly important to me. My mom is the oldest of five girls born to a headstrong German woman and an Air Force Irishman. The aunties are all very different, and each excels at her own chosen field. More on them later. Between all of the aunts, my Nana and PopPop now have a brood of twelve grandchildren and one soon-to-be great-grandchild. We are close to the point of embarrassment at family functions, and that is just the beginning. There are seven other branches of this extended family, all of them German/Irish and all of them crazy. I say that with love. Point being that there will be MANY out of towners at my own large wedding, so I have sympathy for brides who have to spend time on these. 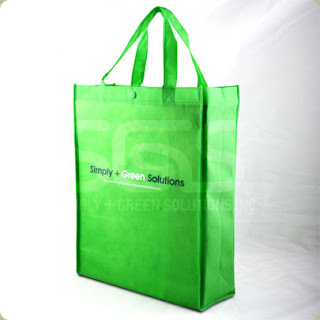 A resusable, custom-printed grocery tote. You can buy these at any store nowadays, but you always end up advertising their store every time you use it (The bag screams, "Hey! Look! Target is eco-friendly!") and I feel weird about using one store's bag at another store so I end up buying another, hence totally defeating the purpose. But these can be custom printed with your company's logo- so why not a monogram? That way, your out of town guest gets to acutally keep and re-use the bag, remembering your fantastic weekend of wedding awesomeness each time. 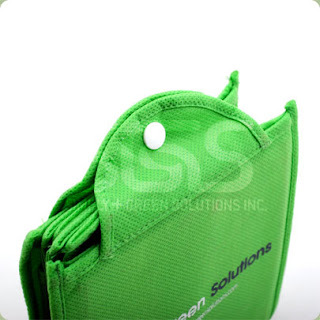 They have lots of cool options, many of which fold or collapse for easy storage. You could totally tuck this in your glove compartment or purse so that you would have it for a quick run to the store. 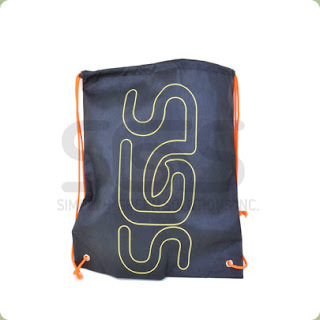 And check out this neat drawstring one! It would be perfect for a mini-gym bag or something that is very needed in our home: a doggy diaper bag. The downside? They must be crazy expensive. I'm sure it would be much less expensive to purchase recycled paper bags and print labels from a home computer. But what a cute idea! What do you think? Would this bag option/favor be worth the price, especially if most of the guests are out of town? Are out of town bags worth the trouble? Hehe. Good luck! Out of town bags were one thing that I didn't have the time, money, or patience for, so I quickly made the decision to nix them. It's fun coming up with all sorts of neat stuff to fill them with, though!